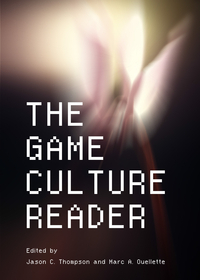 Though it’s a bit hard to find at the moment (Amazon is really treating this book a little too exclusively), The Game Culture Reader is now available! I’m delighted my essay, “Movies in the Gameworld: Revisiting the Video Game Cutscene and its Temporal Implications,” appears in its pages among such an august collection of video game scholarship. A special thanks to editors Jason Thompson and Marc Ouellette, who braved the vagaries of publishing like polar explorers to bring us this little gem of a book. It can be ordered directly from Cambridge Scholars Publishing. My chapter grapples with the problem of time in video games, especially as the various (and often incompatible) timeframes found in games become further perturbed by cinematic cutscenes–a “film time” that can steal temporal and interactive coherence from the game in favor of narrative drive, cinematic spectacle, and other potent but problematic “benefits.” However, as I find in analyzing combat cutscenes during Fallout 3–insights occasioned by the game’s frequent glitches during those very cutscences–the movies we find in the gameworld can actually serve a salutary function, restoring temporal order and reinforcing player-world coherence. This doesn’t make me a fan of the current trend in big-budget games to indulge in gratuitous cinema envy, but if nothing else my analysis reminds me that even bad tendencies have good applications.